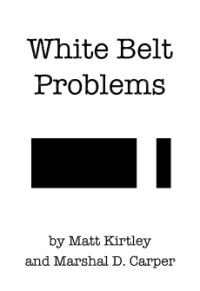 Home » BJJ Belts & Promotion » How long does it take to get a black belt in Brazilian Jiu-Jitsu? How long does it take to get a black belt in Brazilian Jiu-Jitsu? On average, it takes 10 years to get a black belt in BJJ. Some people earn a BJJ black belt faster, while other earns it slower. A survey of 1500+ jiu-jiteiros found that promotion timelines ranged from 3 to 16 years, with most being between 8 and 12. BJJ black belts are notoriously hard to get. Even 5-7 years is considered fast. Anyone earning it faster than that is usually a phenom who trains everyday and blasts their way through competition. The IBJJF requires someone to be at least 18 years old to earn a black belt, so there are no kids with black belts like you find in other martial arts. The IBJJF’s minimum time requirements for each belt put the fastest path from white to black belt at 4 1/2 years. Despite all that, you still see a few black belts in their early twenties, but they have usually been training since childhood. The IBJJF has several others requirements for black belts to fulfill to be recognized and earn degrees (like CPR certification and attending referee courses). They also require the instructor who promotes someone to black belt to be a 2nd degree black belt or higher. You can read more about degrees here: Why do some BJJ belts have stripes and what do they mean? Note that not every BJJ affiliation recognizes the IBJJF standards, and they may follow their own. The Gracie Academy is a notable example of this. As with all BJJ belts, the decision to promote to black belt is ultimately up to the student’s instructor. BJJ lacks any standardized syllabus or grading tests, such as are found in arts like judo. Each BJJ instructor has their own standards for promotion, and they may or may not have a formal test (most don’t). See Do you have to do a test to get a belt promotion in BJJ? for more on this. An adult who joins a BJJ academy and trains 3 or more classes per week can expect their path to black belt to take about a decade. The actual speed will vary based on a wide variety of factors ranging from the person’s age and athleticism, natural talent, previous martial arts and wrestling experience, breaks in training (injuries, life changes, etc. ), tournament success, their instructors standards, and a million other things. The best approach to take is to just train hard and make sure you deserve the belts whenever you get them!